Slightly Askew Designs: Can't Believe I Forgot! Ah! 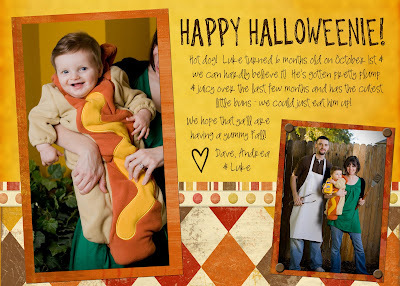 I can't believe that up until now I've forgotten to post my very favorite card ever... our Happy Halloweenie card from last year! I never got around to sending birth announcements out (bad mommy, I know), but we sent these out about 6 months later! ha!